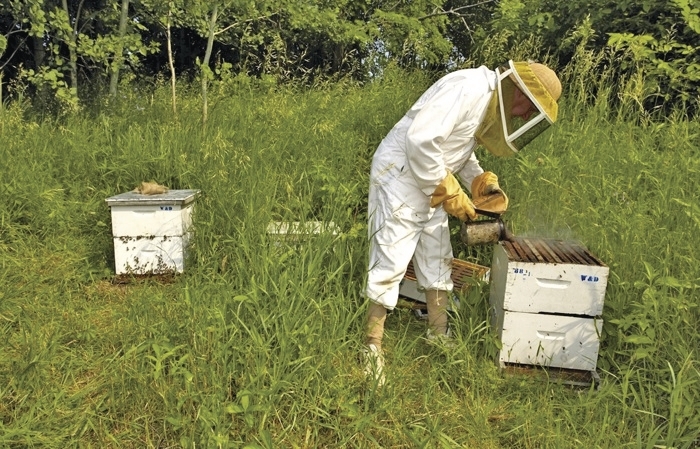 They may look a bit like scientists from a sci-fi flick in their special white suits and head gear, but beekeepers are practitioners of an ancient art that has been enjoying something of a resurgence in Ireland in recent years. The number of beekeepers nationally has grown from 1,500 five years ago to 3,300 today, based on the membership of beekeeping clubs all over the country. Anyone who has ever wondered about beekeeping and how to get involved may well be interested in an upcoming two-day beginner course from the Westport Beekeepers Association this April 11 and 12. The course will help bee enthusiasts get on their way to developing a buzzing new hobby, according to local apiculturist Dermot O’Flaherty. Beekeeping, or apiculture, has been around for at least 4,500 years. Efforts to domesticate bees in simple hives have been noted in Egyptian art from 2,500BC and the sweet offering of the bee has been prized for much longer. Some rock paintings of humans collecting honey from wild bees date back to 15,000 years ago. For Mr O’Flaherty, the modern era of beekeeping is as much about the preservation of the humble honey bee as it is about enjoying the fruits of its labour. “We are trying to save the honey bee,” he outlined. “The bee has been in trouble for some time now because of the growing use of pesticides and pests such as varroa mite. Keeping the bee alive and buzzing is of paramount importance. The bee is nature’s great pollinator. Without them, plant life as we know it would cease to exisit and perhaps human life too because bees pollinate about 70 per cent of the plants we eat. “I don’t want to see the world decline because we have lost the bee,” said Mr O’Flaherty. The Westport Beekeepers Association is one of three such clubs in Mayo, with the other clubs working out of Ballina and Ballyhaunis. The Westport association was launched five years ago and already membership has grown to 100 beekeepers, accounting for 450 hives in Mayo between them. Aside from the preservation work involved in beekeeping, it is a wonderfully rewarding hobby, according to Mr O’Flaherty. Taking part in the course could get any budding apiculturist well on their way to tending their own bees. The course costs €50 and is delivered by a senior beekeeper, certified by the Federation of Irish Beekeepers Association. It is delivered from the Teagasc Centre, Newport Road, Westport. Club membership for the year costs a further €50. Once a participant completes the course and joins the club, they are eligible to request bees for their own hive. A hive in Mayo could yield anywhere between 40 and 140 Ibs of honey in any one year. With honey selling at an average of €8 a pound, the hobby could well pay for itself within a couple of years, added Mr O’Flaherty. For more information on beekeeping and the upcoming beekeeping course with the Westport Association of Beekeepers, contact Dermot O’Flaherty on (087 ) 2464045. Page generated in 0.1099 seconds.